2018 is coming to an end, but that doesn't mean your sustainability actions have to! Use the holiday season this December to shop sustainably for your family and friends by buying gifts locally. This month's challenge is similar to last month's, but with a special Halloween twist! Try making your Halloween costume this year using only items you found at a local thrift, secondhand, or vintage store in your area. In the last few weeks, news has broken that over 90 elephants were poached for their ivory in Botswana, which is unprecedented and has happened directly after the President decommissioned the anti-poaching division. Right now, my profile picture is with one of these poachers’ possible future victims, a rescued juvenile from the region where the recent poaching event occurred. My phone also bleeds with nostalgia from July, when I had the honor to meet ex-Toronto Zoo elephant, Cathy, and a whole group of rescued elephants. One of the charismatic youngsters, Naledi, even has her own film on Netflix! 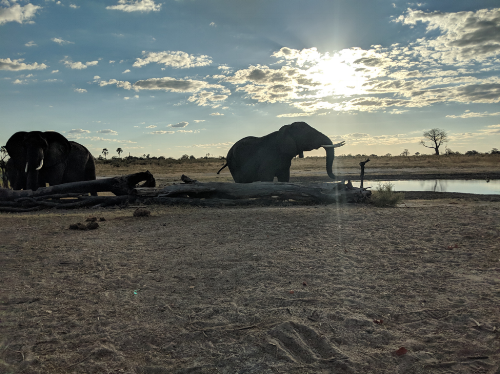 This summer, I studied alongside a group of students from London and Sydney with ASU to study in Botswana’s Okavango Delta, one of the last free flowing river basins in the world, renowned biodiversity hotspot, and a UNESCO World Heritage site. Our group in the Delta was a mosaic of intellectual backgrounds and cultural heritages. That mosaic melted together the minute we got in the bush plane from Maun and crossed the wildlife fence. By that time, we all shared something highly unique: we became guests in our environment. It is hard to imagine in an age of cell phones, modern science, and megacities that we as humans are here to share our time here on earth alongside well-loved megafauna like elephants and lions, but also the lesser adored dragonflies and grasses. When I got news about the poaching, I felt compelled to change my profile photo, because it felt like I was reducing that elephant’s resilient life journey into something zoo-like. Visiting with the Abu Camp’s rescue elephants was one of the most existentially humbling moments of my life and represents a small sliver of what it feels like to be a guest in my environment. I think we could all use a little more of that in our world these days. So, I aim to spread the word about the amazing researchers, conservationists, and wildlife managers I had the opportunity to meet while in Botswana. My newfound colleagues dedicate their lives debunking human-animal conflict and encourage pathways to co-existence. Elephants Without Borders (EWB) were our gracious hosts in the Delta, especially Dr. Tempe Adams, who has dedicated her life to researching elephants and improving elephant-human co-existence. EWB and the Paul G. Allen Foundation completed the first Pan-African Elephant Census, which has shown that there are sharp declines in elephant populations on the entire continent. While we can’t all dedicate our lives to fieldwork and on-the ground advocacy, we can do more. From reducing single-use plastic to educating ourselves about this complex, beautiful world we live in, I think most people would be shocked to understand the extent humans have impacted our earth, the creatures that live here too, and those who may not make it with us. Consuming and digesting news media is insufficient to address our world’s “wicked problems,” but taking actionable steps can help, one step at a time. What’s the actionable step you took today? This week? This year? To learn more about EWB’s amazing work and about elephants in Africa, check out the movie Naledi: A Baby Elephant’s Tale. As one of the only organizations of its kind, EWB conducts urgent and meaningful work. They also work with other non-profit organizations and local policy-makers for the good of both animals and humans, in Botswana and beyond. Consider donating to their cause. Upcycling is taking something old and making it new again, whether that be finding creative ways to use gadgets and knick-knacks that are out of style, recycling trash into something useful, or refreshing tired old furniture. Try it for this month's sustainability challenge! Long summer days and plenty of sunshine means there's no need to have lights on in the house all the time. Hopefully your home or office has plenty of windows so you can make the most of the natural light during the day. This month, try turning off the lights in your home or office from 6 am to 6 pm as much as possible. You'll save energy and money! It just keeps getting hotter here in Arizona, which means we can turn up the thermostat this month, keeping ourselves comfortable, our energy bill low, and our carbon footprint even lower! It's heating up here in Arizona, and staying hydrated is super important. Make sure you're doing so this month and also protecting the planet by ditching the disposable bottles and getting a reusable one for your beverages. Meatless Mondays can improve your health and the health of the planet! Check out today's post for more information and great recipes for vegan and vegetarian cooking. In this week's column, we explore the significance of fifteen simple worlds. In this week's column, I'll share a story that caused me to think about unintended consequences in a new way. Farmer's Markets are a great place to support local businesses and farmers, improve local biodiversity, and get fresh, healthy food for you and your family! April is the perfect time in Arizona and across the country to visit a local farmer's market and check out the produce. What can self-driving cars learn from old railroad trolleys? This week we'll explore how the classic Trolley Problem can be reconstructed to think about one of the potential impacts of self-driving car technology. Spring is in the air, and you know what that means...it's time for everyone's favorite activity: spring cleaning! But household cleaners can be toxic. Get creative for March's challenge by making or buying your own eco- and people-friendly household cleaners. In this week's column, we explore the quintessential question that haunts all distance relationships, and one potential consequence of answering it at face value. How do we think about cooperation? What's better than a long hot shower on a cold winter day? But hot showers represent one of our biggest home energy and water wasters. During February, try limiting your showers to five minutes or less, and skip a shower every now and then. It's good for your skin in the dry winter air and it's good for our planet! What do rubber buttons and Argentine tango have in common? Find out in this week's column, as well as some useful tips for creating some homemade negentropy. If your New Year's resolutions include living more sustainably, then you should join us for our 2018 Sustainability Challenge! Every month we'll be posting a new challenge geared toward more sustainable living 🌎 This month: reducing use of plastic bags, big and small! Introduction to our first opinion column, Big Ideas from Little Things, by The Sustainability Review's newest author Matt Nock, a musing and amusing PhD student with lots to say. Check back here every 2 weeks for a new insightful article.